Web Designer, Web Developer, UX Designer, and UI Designer: What’s the Difference? The Web has done a lot to transform the way we live over the years. It has changed the way that we work and communicate. Although many businesses still work with data in a hard-copy form, much of it is stored in online databases, with employees at various locations accessing it through centralized web portals. Instead of relying solely on postal mail or messenger services to send correspondence back and forth, email has become the main form of written communication for both professional and personal purposes. Another big difference the Web has made is that is has changed the way organizations, including government agencies, serve the public. For example, instead of a driver going to a local DMV office to renew his vehicle registration, he can just do the entire process online without direct assistance from personnel. Indeed, the diverse range of applications that the Web offers to individuals and businesses have revamped the way we live and work. What they’ve also done in the process is to create new types of jobs in the technology sector: web designer, web developer, UX designer, and UI designer. These roles have become absolutely necessary for everything from websites and online portals to mobile apps in order to make them presentable, easy to use, and operational. However, the only thing that hasn’t been clear to many is what the difference is between these four roles. As a matter of fact, many wrongly use the names of these jobs interchangeably. For instance, web developers are often mistaken for web designers, and UI designers are sometimes mislabeled as UX designers. Although these professions have some skill sets and tasks that intersect, they are still distinct in their functions and end objectives. Here is an overview of these four professions and how they may be similar to but different from each other. Web Designers are essentially responsible for the visual presentation and aesthetics of a website or web application. Usually, with input from clients and oversight from managers, web designers create the layout prototypes of a website that include placement of menus, buttons, copy, images, and other elements. They also determine the overall style and theme of the site, coming up with color schemes, decorative graphics and icons, and typefaces that come together to create an attractive, cohesive look for the site or app. Web designers typically use tools like Adobe Photoshop and Illustrator to create customized graphics and artwork for websites, and they use applications like Mockplus to create wireframes, which are schematic illustrations of page layouts of a site. Although web designers are on the creative, artistic side of the website creation process, them possessing technical skills is not only helpful but sometimes necessary for them to do their jobs successfully. For instance, although the designers are only responsible for the visual look and layout of a site, with developers having the task of using code to translate the designs into a live site, it helps for designers to be familiar with the HTML and CSS code that will be used to bring their designs to life. Being code-savvy and aware of how code is used to execute layouts can help designers make sure that their designs are feasible and will display well in the final product. User experience, abbreviated as “UX,” is how well a user on a website is able to navigate through site, which includes how easily the user can identify what the elements like buttons or boxes on a page are, how quickly they can find information they are seeking, how long it takes them to complete a task like filling out a questionnaire, etc. Therefore, UX designers are concerned with making sure that every kind of possible user who visits a site has a productive experience and that the functionality and appearance of the site work together to help users fulfill their intended purposes for visiting the site. UX designers utilize research and methodologies to design and coordinate the process flows of activities performed by users on a site to ensure that users can do them with as much efficiency and ease as possible. For instance, depending on the purpose of a particular website, like a business card website that lets visitors design their own cards online, a UX designer may start off doing some research to create user personas of different backgrounds and ages of the types of visitors who will likely use the site. With the personas in mind, the designer may then develop process prototypes of tasks on the site using wireframes or other tools. Once the designer has a web developer create demo versions of two prototypes on preliminary websites, the UX designer will conduct studies like A/B tests by having volunteers with the designated user personas come in and try the different prototypes of the site and compare their experiences on both. Using volunteer feedback, UX designers will go through several iterations of process design and A/B testing until the user experience reaches the level where it needs to be. User interface (UI) design, is a relatively narrow specialty that somewhat extends and parallels UX design. UI design is the skill of developing digital machine-human interfaces for optimal interaction. It involves creating interfaces that incorporate branding while being visually appealing, intuitive, and mentally and emotionally engaging for users. An example of what UI design entails is making an online application as proactive and responsive for visitors as possible. This could involve making sure that users fill out the fields of a form in sequential order, highlighting a required input field in red if the user skips it. It could also display a green checkmark or confirmation message when a user successfully completes the form. 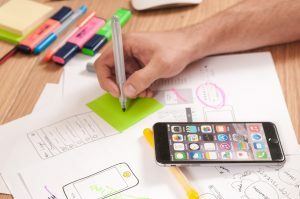 Along with these helpful interactive elements, there could be some design aesthetics like company logos or amusing quotes that personally connect with users, which can encourage them to visit a company’s website again or become loyal customers. So the personal connection aspect of UI is important because it encourages brand promotion and customer satisfaction. UX and UI design are similar in that they seek to create productive experiences for users through thoughtful process design. However, UX is more on a general level, while UI focuses granularly on the step-by-step details to execute the designs. Likewise, UI design seems to also overlap with web design to some extent, since it does involve visual design. However, unlike web design, UI design is limited to digital interfaces, not necessarily including an entire webpage or website as with web design. Also, while the visual appeal component of web design focuses on just being pleasing to the eye, the visual aspect in UI design concentrates not just on presentation but also on making the visual look conducive to engaging, productive interaction for the user. If you work in the web industry or are considering a career in this field, then you want to make sure that you have good familiarity with how websites and web apps and the networks they exist on operate. It’s also imperative to be aware of how to keep these sites, apps, and networks safe from cyber threats. Build on your knowledge of websites and networks with courses from Cybrary.